CAUTION Be careful not to allow children to swallow the battery or removed parts. Remove the screw A .
Insert a small screwdriver into the slit of the corner B and twist it to separate the upper part from the lower part. Use a cloth to protect the casing. Do not touch the internal circuit and electric terminals as doing so could cause a malfunction. Make sure that the + side faces the bottom of the case C .
Recommended battery: CR1620 or equivalent. Close the lid and install the screw securely. Operate the buttons to check its operation. See a NISSAN dealer if you need assistance for replacement. If the battery is removed for any reason other than replacement, perform step 5. An improperly disposed battery can hurt the environment. Always confirm local regulations for battery disposal. 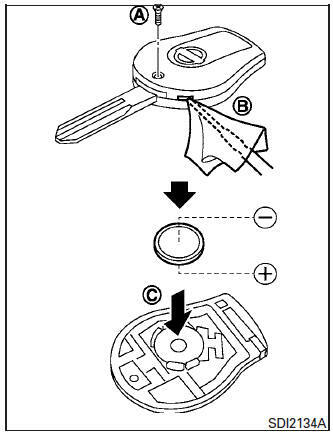 The key fob is water-resistant; however, if it does get wet, immediately wipe completely dry. The operational range of the key fob extends to approximately 10 m (33 ft) from the vehicle. This range may vary with conditions. Operation is subject to the following two conditions: (1) This device may not cause harmful interference, and (2) this device must accept any interference received, including interference that may cause undesired operation of the device.